Choosing equipment and then arranging finance can be time consuming, but for New South Wales contract harvester Allan Every, the finance portion is a breeze, thanks to the line of credit he has set up with CNH Capital , the finance company behind New Holland agriculture. “I tend to choose New Holland gear, so I've set up a line of credit with CNH Capital because it makes it so quick and simple to arrange the finance at the same time as I choose the equipment,” said Every. CNH Capital’s line of credit offers farmers a pre-approved credit limit to draw from when purchasing equipment, removing the need to apply for farm finance with each separate purchase. “Having a line of credit means I can choose new equipment with confidence that it will be delivered and put to work sooner rather than later, so my business isn’t left waiting for the finance to settle. It gives me the freedom to take advantage of business opportunities as they arise,” said Every. CNH Capital offers a range of other specialist equipment finance products, including mortgages and lease options. 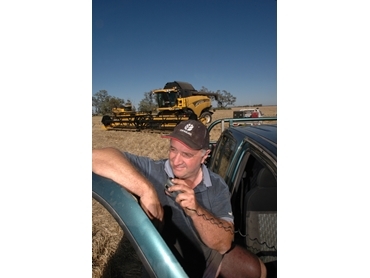 Allan financed his New Holland T7060 tractor with a goods mortgage, which allows him to take advantage of tax deductions relating to equipment depreciation and interest costs. This type of loan offers a low fixed interest rate and fixed repayments with a flexible deposit and flexible payment schedule. With CNH Capital Express, eligible applications are processed in just 90 minutes, which means farmers can arrange their farm finance while they’re at the dealership and it could be approved by the time they get home. “CNH Capital Express is a great option for customers who want to take advantage of limited-time opportunities like the recent tax breaks or the end of the financial year. It’s fast and convenient and there’s not a lot of paperwork involved, so farmers can be back on the job in no time,” said CNH Capital Marketing Manager Tony Kim.